Q. What was harder, the last 30 seconds or the long wait before the game began? COACH MIKE BABCOCK: You know, even in the last game, the last minute and stuff like that wasn't long or harder, it was just doing what you do. The interesting thing is when you're playing in the Stanley Cup Final like this and it's a closeout game, the emotion on your bench is so much more than you've had to deal with. Getting guys on and off the ice is more difficult, and yet we have a real committed group. 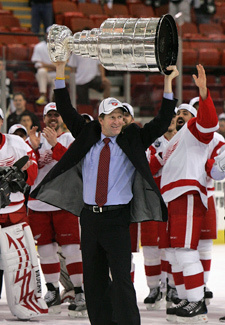 Nicklas Lidstrom, in my opinion, is a phenomenal leader and captain. And with his poise and his skill. And then the support group in [Chris] Chelios and [Kris] Draper. And [Pavel] Datsyuk and [Henrik] Zetterberg, for their leadership. You know, we have a very special team, and we're thrilled to be in this situation, obviously. Q. All season long you were so focused on the process. Now that you got to the end and your name is going to be on that Cup, what are your emotions? COACH MIKE BABCOCK: Well, you know, I probably haven't come to grips with that. But to be able to share this journey with the guys and to be able to share it with the city of Detroit, and obviously my family, that's very emotional. And I'm sure I'm going to have some emotional moments in the next week just thinking about it. But to have your name on the Stanley Cup, pretty special. Q. How important was it to get that first power play goal tonight? COACH MIKE BABCOCK: I think always scoring first is very important, if you possibly can. And it's not like they weren't given some opportunities on the power play tonight. We had to do a good job on the penalty kill and we just found a way to win the game. Q. Can you just talk about the effort that the Penguins gave you throughout this series? COACH MIKE BABCOCK: Well, the news since the cap world, everybody's good. We played four tough series. I can't remember who we played last it seemed so long ago, but they're all good. The battle we got from Nashville, from Colorado, and Dallas to play a talented, talented group like this, I was very impressed with [Penguins coach] Michel Therrien's ability to run the bench. He has a good feel to know who is playing the best, and he makes adjustments accordingly. I thought he made it hard for us as a team. And to me he's done a fantastic job with his team. They just keep getting better and better. Mario [Lemieux] and his ownership group here got a good thing going here. Obviously the city of Pittsburgh. Q. Chris Osgood is usually a guy who flies under the radar. He probably had the best two games after losses; can you talk about his ability to play in those games? COACH MIKE BABCOCK: I think Ozzie is a fantastic story. You talk about us, but when you pull your goalie in the first round of the Stanley Cup playoffs, that usually means you're going fishing in about three days, and not 14 more wins or whatever we needed to get it done. You gotta give him a lot of credit. He sat in my office at my house three years ago or two years ago, I guess, after the season and talked about reinventing himself and finding a way, and he did. He learned how to butterfly, and he's improved his game. And he's now back as one of the top goalies in the League because of his mental toughness and his sticktoitiveness. And I think he showed that in bouncing back and winning tonight. Q. In the past you've come within a game of winning the Cup. So from one coach to another, what would you say to Michel Therrien who is not feeling too good right now? COACH MIKE BABCOCK: Well, I can tell him that he's won at the Junior level and Minor Pro level and now he's a winner at this level. He's going to get his opportunity. And coaches don't get here by accident. And you need good players, and he knows what he's doing. He's done a good job. In the time he's been here, he's made a huge difference. You don't get here without being a big believer in yourself, and he's obviously that. He did a heck of a job, and he should be proud of himself and his team. Q. Can you talk about [Henrik] Zetterberg's performance in winning the Conn Smythe Trophy, the attention on both ends of the ice was something to see. COACH MIKE BABCOCK: You know, I mean, someone said to me here earlier, you turned your best offensive players into checkers. I never did that. They're just very good both ways, and deliver offensively. And that's the philosophy I have, anyway. I believe if the people that are playing against the best people can score, they gotta worry about them. If you've got guys who don't score playing against those people, they can just let it go on offense all the time. Z and Pavel [Datsyuk] are two of the best players in the world. And when you put [Brian] Rafalski and Nick [Lidstrom] on the ice with them, I mean, that's a pretty special group. And [Penguins forward Sidney] Crosby and [Penguins forward Marian] Hossa gave us all we could handle, and yet it was great to see us, obviously, get this done. Q. Ken Holland said just a little while ago that you guys had to lose the Anaheim series to get back here. So when something like that happens and you go through a long road, how do you reset yourself for another long, not so guaranteed struggle to get back? COACH MIKE BABCOCK: Well, it's difficult, obviously. But if you go through the last three years in the NHL and the amount of games we've won, I mean, we won 58, we won 50, and we won 54. So do the math there. And then we flamed out. We went 2-4 against the Oilers. And last year we got to the Final Four, won a lot of games. And this year it's been a process. It didn't happen overnight. We've been a good team, and I think elite, elite team for the last three years. And we were finally able to get it done.